Figure 2.1.1 presents a schematic of typical growth behavior for a crack being observed in a structural element as it moves from an initial damage size to a damage size that causes structural failure (loss of structural safety). Note that the x-axis measures either the elapsed time (t) during which loading is applied or the number of loading events (N) applied, and the y-axis measures the corresponding length of crack observed in the structure. Typically, the elapsed time is given in operational flight hours and the number of loading events is counted (grossly) by the number of the aircraft’s flights. The crack grows in response to the cyclic loading applied to the structure. Any crack will grow a given increment (Da) in a given number of loading events (DN), the rate being measured by Da/DN. When the crack length reaches a critical value (acr), the growth becomes unstable, thereby inducing failure. When the crack (a) reaches the critical length, the measure of loading (t or N) reaches the structural life limit (tf or Nf). The structural life limit is a measure of the maximum allowable service time (or number of accumulated service events) associated with driving the crack from its initial length (ao) to the critical length (acr). It is the objective of the Damage Tolerant Requirements to ensure that cracks do not reach levels that could impair the safety of the aircraft during the expected lifetime (ts or Ns) of the aircraft, i.e., tf (Nf) must be greater than ts (Ns). As can be noted from Figure 2.1.1, when the crack is small, it grows very slowly. 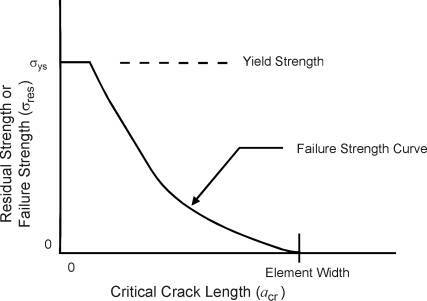 As the crack gets longer, the rate of growth increases until the crack reaches the critical size acr, whereupon fracture of the structural element ensues. While the subcritical crack growth process occurring for a < acr may take twenty to thirty years of service, the fracture process is almost instantaneous. Studies of the failure process indicate a very close relationship between the length of crack at failure and the load or stress that induces the onset of rapid fracture. Typically, this relationship between crack length and failure strength level is as shown in Figure 2.1.2. The cracked element strength is referred to as the residual strength (sres) since this represents the remaining strength of a damaged structure. By considering the basic elements of Figures 2.1.1 and 2.1.2 collectively, a residual strength diagram can be developed as a function of elapsed time (or loading events). A residual strength diagram is presented in Figure 2.1.3; this diagram shows that while the structure is young (t<< tf) the residual strength capacity is basically unimpaired because the crack is both small and doesn’t grow much with time. As the structure starts to age, the residual strength capacity is shown to decrease and just prior to failure, the rate of decrease in residual strength capacity is accelerating because now the crack is rapidly becoming very large. 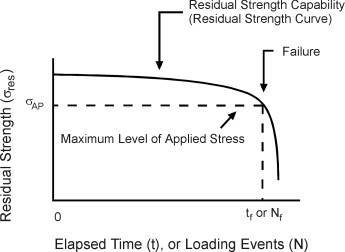 When the residual strength capacity equals the level of the maximum stress in the operational history, failure occurs. As implied by the residual strength diagram, a ten to twenty percent change in the maximum applied stress in the operational history would not normally affect the allowable structural life significantly, assuming that the subcritical crack growth process (Figure 2.1.1) was unaffected. Normally, when the loads in the operational history change, the subcritical crack growth process changes its pattern of growth and this in turn affects the residual strength diagram and the allowable structural life.